Bipolar affective disorder, also known as manic-depressive disorder is a serious psychiatric condition. Patients afflicted with this disorder have cyclic attacks of depression alternating with mania. Two important medications that are used to control these symptoms are mood stabilizers and antidepressants. These medications are that control mood swings among patients with bipolar mood disorder. It also has the added benefit of preventing recurrence and worsening of symptoms making them the drug of choice for patients with this condition. Mood stabilizers act by decreasing neuronal activity to control exaggerated cellular mechanisms responsible for symptoms of mania and depression. They are also given for other psychiatric conditions such as schizoaffective disorder, depression and impulse control disorders. This is the prototype of mood stabilizers and is the universally preferred treatment of bipolar mood disorder. It is commonly prescribed for the manic phase of the disease with a success rate of 60-80% in achieving remission. Apart from this, it is also chronically used for maintenance of mood and as a prophylaxis for abnormal mood swings. Evidence suggests that lithium has neuroprotective effects because it preserves the volume of brain structures involved in emotional regulation. It also balances neurotransmitter function by reducing the activity of excitatory neurotransmitters such as dopamine. It enhances gamma amino butyric acid activity that has an important inhibitory function. Lithium has anti-suicidal properties that are unique to this medication. These complex therapeutic actions of lithium are helpful in controlling the manic phase of bipolar mood disorder. These medications were originally designed for treating epilepsy. However, it was discovered that they are also useful in controlling unstable moods by decreasing the rate of neuronal firing necessary for brain activity. Valproic acid, also known as Divalproex sodium is an anti-seizure medication that is found to have mood stabilizing effects. It controls manic symptoms in patients with mood disorders. The exact mechanism of action is still uncertain but research shows that anti-manic effects of Valproic acid are due to decreased neurotransmission and stabilization of ionic channel sensitivity in voltage-sensitive ion channels. According to the American Psychiatric Association, it is also a first-line treatment for the manic phase of bipolar mood disorder. This medication is also used to treat mood disorders when first-line medications are contraindicated, or in medically refractory cases. It is used to treat and prevent manic symptoms alone or in combination with other mood stabilizing agents. It stabilizes voltage-gated ion channels of sodium and potassium and enhances the activity of gamma amino butyric acid B receptors. GABA-B is important for inhibitory neurotransmission. Aside from controlling manic symptoms, it is also used as a long-term mood-stabilizing agent. Its efficacy is comparable to Lithium with a more favorable side effect profile. Antidepressants are medications used to treat depressive disorders. It is also indicated for depressive symptoms of bipolar mood disorder such as extreme sadness, lack of energy, difficulty sleeping, lack of appetite and suicidal thoughts. In treating bipolar mood disorders, it is usually given in combination with other mood stabilizers because when used alone, it can potentially worsen manic symptoms. Antidepressants are also given to control symptoms of attention-deficit/hyperactivity disorder (ADHD), anxiety disorders, obsessive-compulsive disorder, chronic pain syndromes, enuresis and other psychiatric diseases. Chemically, these medications contain three benzene rings, hence called tricyclic. They act by blocking the absorption of certain neurotransmitters such as serotonin and norepinephrine, making them readily available within the body. These neurotransmitters are known to improve mood and brain activity. Prototypical drugs under this class are Imipramine and Amitryptiline. 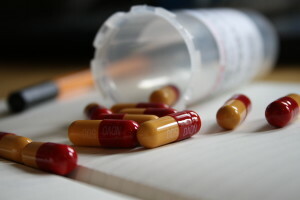 These medications are also called second and third generation antidepressants. Compared to first generation antidepressants, they have different effects on dopamine, norepinephrine and serotonin. They also differ in potency. Buproprion is useful in treating symptoms such as extreme fatigue, psychomotor retardation and apathy seen in severe depression. It is also prescribed for smoking cessation purposes, causing a reduction in relapse rates. Mirtazapine is another representative medication from this class. It is useful in treating depression mixed with anxiety and agitated depression. These are the first-line medications for treating depression. Its side effect profile is more favorable than other antidepressants, making it more safe and effective. As the name implies, these drugs selectively block the reabsorption of serotonin, making this neurotransmitter more available in the body. Serotonin is a neurotransmitter that has a role in promoting social interactions and boosting mood. Notable medications under this drug classification are Fluoxetine and Sertraline. Monoamine oxidase is an enzyme that metabolizes norepinephrine, serotonin and dopamine in the brain. To maintain balance of neurotransmitters in the brain, monoamine oxidase inhibitors are given. Norepinephrine, serotonin and dopamine are neurotransmitters, which are implicated in brain circuitry affected in depression. Reversibility and selectivity of monoamine oxidase inhibition is responsible for drug side effect profile. Selective inhibitors are safer with fewer side effects. Examples of drug under this class are Selegeline, Tranylcypromine, Phenelzine and Isocarboxazid. The Food and Drug Administration approve all of them for the treatment of depression. Mood stabilizers and antidepressants are psychiatric medications that differ in structure, mechanism of action and prescribing indications. Mood stabilizers act by decreasing the activity of the brain to restore neurochemical balance. They are given to treat positive and negative symptoms of bipolar mood disorder. On the other hand, antidepressants promote brain activity by making excitatory neurotransmitters more available for use. It is given to patients with depressive symptoms and disorders such as major depression, seasonal affective disorder, psychotic depression and depressive phase of bipolar mood disorder. Marinelle Castro. "Difference Between Mood Stabilizers and Anti-depressants." DifferenceBetween.net. February 6, 2018 < http://www.differencebetween.net/science/health/difference-between-mood-stabilizers-and-anti-depressants/ >. Some people take it specifically for serious depression and it can also aid in depression for others (including bipolar) – this is why it’s important to look at your sources and not just take the word of a a random article with no credentials. Burchum, J. R., Rosenthal, L. D., Jones, B. O., Neumiller, J. J., & Lehne, R. A. (2016). Lehne's pharmacology for nursing care (9th ed.). St. Louis,Missouri: Elsevier. Katzung, B. G., Masters, S. B., & Trevor, A. J. (2012). Basic & clinical pharmacology. New York: McGraw-Hill Medical. Stahl, S. M. (2013). Stahl's essential psychopharmacology: Neuroscientific basis and practical application (4th ed.). New York: Cambridge University Press. Woodrow, R. (2007). Essentials of pharmacology for health occupations. Clifton Park, NY: Thomson Delmar Learning.